The G.O. is not a devotee of Christmas cake i.e. fruit cake so it’s many years since I made one. Back in the days when I did, the version I made was simply dried fruit mix boiled in a combination of butter & orange juice and when cool flour, eggs and spices were added; very rich more like a pudding. A little went a long way so I baked it as cupcakes and distributed them widely amongst the family. 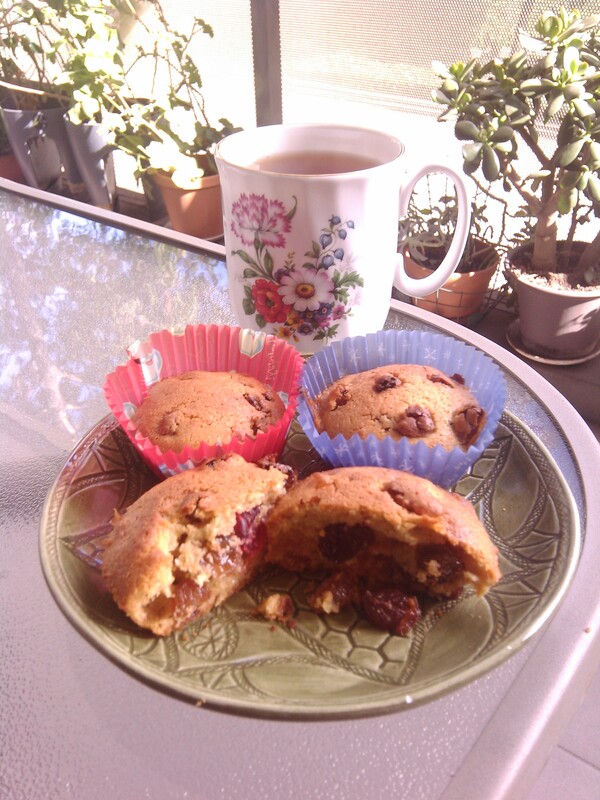 Last festive season visiting my aunt, she produced Christmas “mini muffins” made, she said, from my Nanna’s recipe. The G.O. 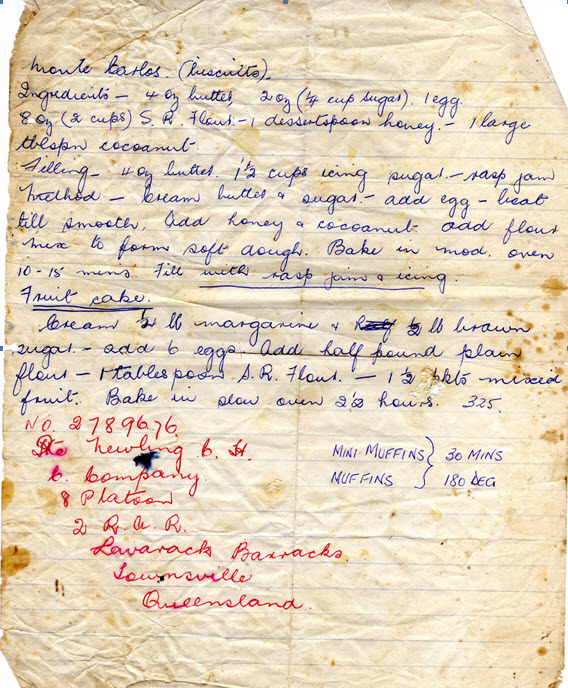 uncharacteristically helped himself to extras, so my aunt emailed me the recipe labelled Polly’s Fruit Cake scanned from Nanna’s book. My sister’s middle name is Beulah, named after our Nanna but Nanna was always called Polly. I hadn’t given thought to making it until the G.O.’s son recently mentioned he had already eaten the Lions charity Christmas cake he’d bought. Upon my suggestion it wouldn’t be difficult to bake one, his suggestion was I do so… for him. Speaking to Dad I mentioned I was making the recipe and asked if he was interested in sampling the test batch. Paying lip service to his diet, he replied “No… Hmmm… Yes… Hmmm… You may as well drop some in”. Cream butter and sugar, add eggs then flour and mixed fruit, and combine. The margarine ingredient is controversial. My grandparents were dairy farmers. We always had butter. Dad said Nanna wouldn’t have used margarine. I tend to agree. However, my aunt follows the recipe and uses margarine. The address recorded on the page as well as the recipes give an idea as to its time. The address is for my uncle when he was conscripted into National Service during the Vietnam War. It may be that’s the clue to the margarine. My uncle was called up and sent to Townsville, North Queensland for army training. Possibly Nanna sent fruit cake to him in a care package. He was a long way from home -1800 km, bad news as far as the family were concerned but mitigated eventually when he wasn’t sent to Vietnam but met, and later married his wife at nearby Rockhampton in December 1971 only months before Nanna died in February 1972 age only 50 + 2 months. I’ve made the Christmas cakes, so… Polly, put the kettle on, we’ll all have tea. As I beat the mixture it turned into a golden batter, and I knew by appearance and taste I’d been there when Nanna baked this cake. The cakes come out of the oven browned, looking a little oily but as they cool they crisp. I ate three for breakfast. This entry was posted in Blog and tagged Australia, Christmas, cooking, family, food. The dawn of a new mother-in-law era… I haven’t just acquired a husband; I’ve also acquired another mother-in-law. My third. Enough for any lifetime. M.I.L.#3 has acted unofficially in that capacity for 9 years but since we shocked her with the news of our unheralded nuptials, when speaking to the G.O. M.I.L.#3 has taken to referring to me as “your wife”. As in “the cards your wife sent out were nice. Everyone had to get a looking-glass, the words on it were a bit small but we didn’t have a looking-glass”. About a month into married life I had a very clear dream where the G.O. and I visited my in-laws from marriage #1. They and their house was pretty much the same, although it was evident time had passed. Possibly they summoned our presence in spirit to convey their blessings. They were disappointed when I abandoned all hope for the success of my marriage to their son. Our respective hopes for that union differed. They hoped for grandchildren. I hoped for a grown up husband. Their son hoped for a wife with surgically augmented DD-cups. Disenchantment all ’round. The two families couldn’t have been more different. Mine: Anglican, big stone church attended for weddings, christenings, funerals; dress as you please; lottery tickets are acceptable goodwill gifts; TV watching; beer & wine drinking. Husband #1’s: Lay church, twice weekly; women modestly clothed often to neck, wrists and ankles, no jewellery; gambling is the devil’s work; no TV with the exception of his mother’s rebellious compromise kept in the cupboard for special shows; teetotalers. I stumbled into this family unawares; inadvertently, promptly flouting the conventions. By far my most serious faux pas was the bathmat incident. During my inaugural overnight stay at the in-laws, careful not to make a mess of the spotless bathroom, I made sure to step out of the shower onto the bathmat, left the floor dry as the desert, and returned the mat to the rail. After her discovery of the reprehensibly damp bathmat, it was left to her son to communicate to me his mother’s long-suffering explanation of what she thought would have been patently obvious… the bathmat is for standing on after one is dry. One should dry oneself within the tiny confines of the shower stall before stepping out. But I was welcomed, and we enjoyed each other’s company: playing board games cards and chatting while their son watched the forbidden TV. They were keen for us to make right our aberrant cohabiting arrangements. After we married, but didn’t immediately embark on procreating, my new father-in-law offered me $3000 cash if I would agree to a grandchild and a further $2000 and his wife’s moonstone bracelet upon production of same. It was an offer I had no trouble refusing, although I would have done pretty much anything else for that bracelet. By the time I encountered M.I.L.#2 I was seasoned. 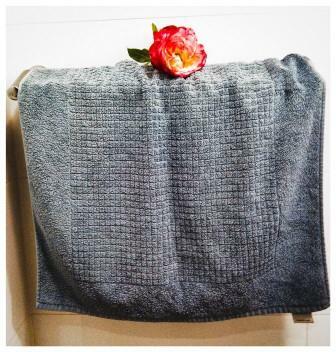 I knew when to offer assistance or not, unblinkingly accept the hospitality status quo, and not to stand on the bloody bathmat (thoughtfulness for which I was complimented!). I shivered my way through a freezing Christmas in south-western Victoria wearing all my clothes in bed as blankets were thin and few. I was grateful for the first-time-guest honour accorded me of not being relegated to the mouldy backyard caravan as had my brother-in-law and his long-time partner. Although I visited their house numerous times, M.I.L.#2’s first visit to mine occurred a few days preceding wedding #2. I made sure there was plentiful food & drink (F.I.L.#2 loved a scotch, disapproval from his wife seemingly augmenting his enjoyment) and their room was comfortable, furnishing it with a duck down doona and pillows: which had to be swapped immediately upon their arrival and the fraught disclosure of M.I.L.#2 ‘s Pteronophobia (feathers). Amongst the many pre-wedding house guests M.I.L.#2 didn’t reciprocate my when-in-Rome style: 24 hours later not much had been deemed agreeable. Granted her trip must have been tiring, as M.I.L. #2 stayed in her room late on the wedding day while the rest of us thought left-over chocolate cake & champagne was a fitting breakfast including the dog and cats who had been served their portions convivially on saucers. Upon emerging, being offered same, M.I.L. #2 surveyed the scene clearly appalled, and declined, ingesting as little as possible except tea for the duration. We maintained polite relations for almost another decade but I’m pretty sure M.I.L. #2 doesn’t miss me. Despite prior acquaintance with M.I.L.#3 via my friendship with the G.O., the slate was wiped clean upon commencement of our defacto in-law relationship. Once again I had to watch my step (although I’ve never ventured a shower) and my tongue. One of the good things about M.I.L.#3 is that her son is like her in many ways. Understanding one gives you insight into the other. For instance, neither necessarily conveys what they mean, evidenced by a disconcerting discussion between M.I.L.#3 and her sister on fashion merits of chicken thighs… not the sort from the supermarket, the ones inserted into a bra for figure enhancement… aha, chicken fillets! Other than M.I.L.#3 demanding to see our marriage certificate as proof we weren’t lying, we’ve had a fairly amicable relationship since the time I was asked my thoughts about financial arrangements they were considering, and foolish enough to venture the honest opinion that it was unfairly one-sided in M.I.L.#3’s favour. Wrong answer. M.I.L.#3’s sulk lasted a blessedly peaceful couple of days; our visits greeted with silence. The G.O. kindly indulged his mother her mood, but eventually advised “think about it, we’ll be back tomorrow”. Upon our return M.I.L.#3’s greeting was friendly, details of revised financial arrangements cheerfully proposed, and my opinion once again sought, but not proffered. M.I.L.#3’s house, garden and self are immaculately turned out, and she’s dubious about my casual sartorial approach, helpfully suggesting the local department store’s lovely but expensive selection of apparel and the nice affordable clothes to be had in Coffs Harbour. By way of complimenting me on any efforts, M.I.L.#3 predictably and frequently admonishes me that I have gone to too much trouble. She also doesn’t practice what she preaches, her Christmas extravaganza outshining my modest offerings. We did manage to underwhelm her by announcing we’d eloped and married on the beach in day clothes; and were informed that proper protocols of guests and attire would have been preferable. As Christmas approaches the G.O. navigating his mother’s traditional “oh you’re so busy we don’t want you to make a fuss” protests about Christmas lunch conceded only her wish to contribute her customary festive $80 lobster (costing $40 any other time of the year) of which we each get a single bite-size piece. On Boxing Day, my own step-daughter-in-law will pay us a visit with her entourage of the G.O.’s son and grandkids. I just want her to know… it’s fine to use the bathmat. If it gets wet, no worries, hang it on the line. Relax. We’re family, make yourself at home… and feel free to get a drink out of the fridge, prepare meals, wash up & tidy a packed-to-the-rafters house… mi casa es su casa. 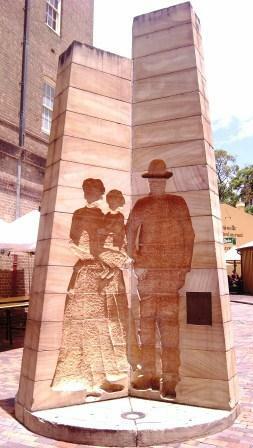 This entry was posted in Blog and tagged Australia, family, humour, my life, my stories, writing. For the Labour Day long weekend the G.O. and I took a well-earned extra couple of days off and headed up to our house on the Mid North Coast of NSW. The night before we left the G.O. packed the ute with bits and pieces we’d accumulated, clothes, wine and the coffee machine. We didn’t alter the G.O.’s alarm clock setting so departed at the usual time he’d be going to work on a Friday – 5.30 am, fathoming the error of pre-packing the coffee machine. We were saved a long hour and half later by Oliver’s Real Food on the freeway where we grabbed coffees, and takeaway sandwiches for later. We hadn’t stopped there before. Their philosophy is “Fresh. Natural. Organic.” Their locations are where you’d normally find only fast food: “we know how hard it is to get food when travelling for people with special diets”. The G.O. and I don’t have special dietary requirements but we were hoping to continue the evolutionary food process upon which we’ve recently embarked. 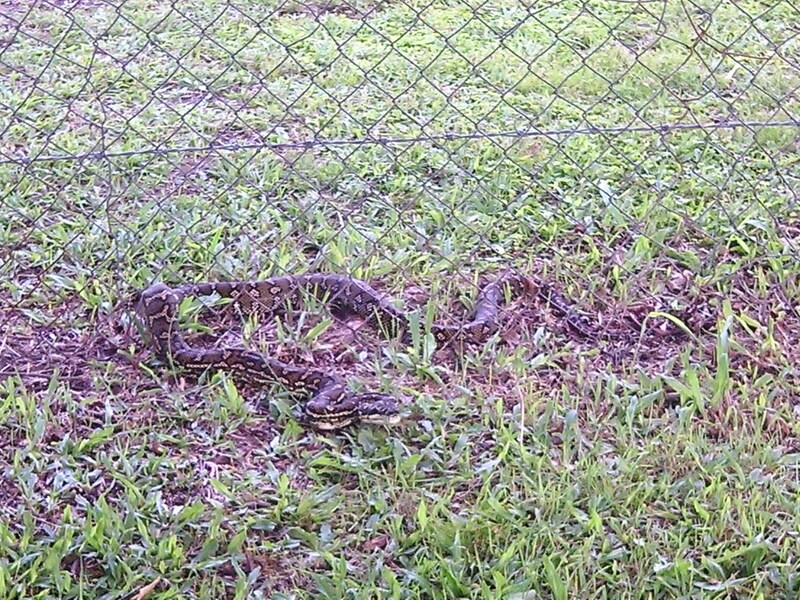 This entry was posted in Blog and tagged Australia, family, food, garden, my life, sustainable living. 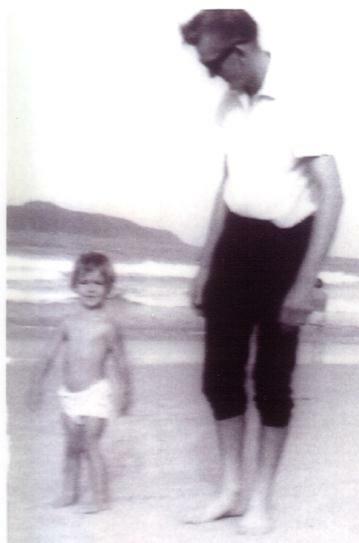 Dad and me c 1967. The bad. My stepmother once mentioned you are your father’s daughter when less than pleased with both of us. This is not news to me. I’ve been my father’s daughter my whole life. You have to take the bad with the good… but my futile efforts to arrange a Fathers Day get-together went from bad to worse. The noisy environs of our apartment mean we often don’t hear our mobile phones ring if it coincides with a passing train. In conferring with the G.O. re his 4WD quest Dad’s taken to calling him directly on his mobile but if the G.O. doesn’t answer then Dad calls my mobile, and leaves messages on both. I missed Dad’s call on my phone but heard the message beep, and caught the G.O.’s ringing so answered Dad’s call. To the point as usual, he explained it wasn’t necessary for us to give him a lift back to collect his ute, he was catching the train but would like to see us anyway on Saturday night. I countered yes, we hoped so too but the G.O. had yet to make arrangements, and it was still likely to be Sunday as he’d been working long hours each day including Saturday and over the course of several weeks, so driving up on the Saturday night wasn’t preferable. Dad barely waited for me to finish before suggesting it didn’t matter if we arrived very late. The G.O. could have a lovely sleep sequestered in the spare room at the end of the hall. I reiterated my explanation. Now concerned for the G.O.’s welfare, Dad suggested he stay on there for the week to catch up on much-needed rest. By this time my patience had run out and my volume had increased, as I announced fine, I haven’t been able to organize anything like that but I’ll put you onto him, and you see if you can do better than me. There’s no dignity in this, I thought, here we are shouting at each other like it’s 30 years ago and I’m 17. As I thrust the phone at the G.O. Dad’s final parry was well that’s whose phone I called. 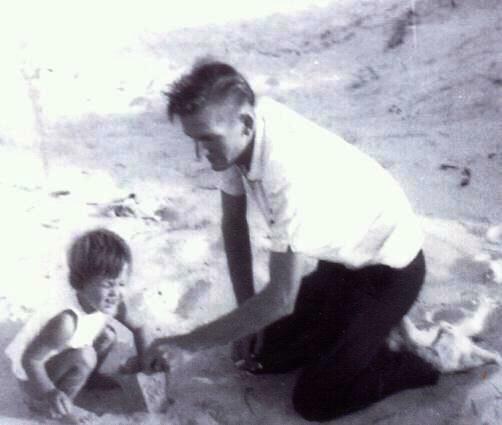 Dad and me c 1967. The good. Sometimes it feels like I have the spiel of our work-life imbalance on loop tape. Trying to explain the troughs, peaks and deadlines of project work and that the G.O. works 6 days a week, as a rule rather than an exception, to family, friends… and ourselves even, gets a little wearing. The plan the G.O. and I made to drive the couple of hours north up the freeway to visit my Dad for Fathers Day and also the G.O.’s son and grandkids en route, came unstuck. Dad rang on the Thursday, giving us advance warning my stepmother had come down with a lurgy. Dad although he sounded snuffily assured me he was fine, as he’d been sensible, unlike Someone Else, and had a Flu Shot. According to news reports Swine Flu is back. We weren’t taking any chances. The G.O. & I are germ-a-phobic; we’re rarely get ill, and there’s a link I’m sure. When we do, we go down like sacks of potatoes falling off a truck, but still have to drag our sick and sorry butts to work. Actually, the G.O. does, I try to manage a day or 2 at home, even if I’m logged on to my work emails. We rain-checked the Fathers Day excursion to the following weekend and spent a quiet Sunday at home. Which the G.O. appreciated as he’s consistently been working 6 long days which seem to be getting longer, and continues to suffer from plantar fasciitis aka sore feet, as well as simply being bloody tired. Continuing the tradition of family hospitality, when the elder of my younger two sisters started work she moved from living at home in the country to my home on the coast. At the time she was vegan, we were all working & commuting, and so we ate a lot of vege rice. I remember Bo, our dog, considering sadly the usually coveted dinner leftovers in her bowl, and looking at me as if to say, not again. All of us busy, it was a DIY household. My sister summoned me to deal with the sizeable huntsman spider in her bathroom. Not my bathroom. Not my problem. Deal with it, was my response. To her credit she did, compassionately, with a dustpan and brush. When my sister decided to end a relationship with a guy she had dedicatedly pursued for quite some time, an afternoon of music and cooking was in order, and so we created Nirvana-Lasagne. My sister is a good musician and terrible sleeper. I believe there is a correlation. Many early morning hours the dull sound of her electric guitar, unplugged, could be heard emanating riffs from the crack under the door to her room. During the time of my sister’s residence, the cats – Baddy & Jack, and Bo benefited most from her company, as my then husband and I were both away a lot. The timing was great. The furry ones loved the extra attention, lap and set of opposable thumbs to open food and doors. The cats colonized her bed, even when we were home.